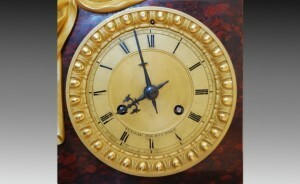 Fine Large Louis Philippe Clock By Deniere, Dated 1833. 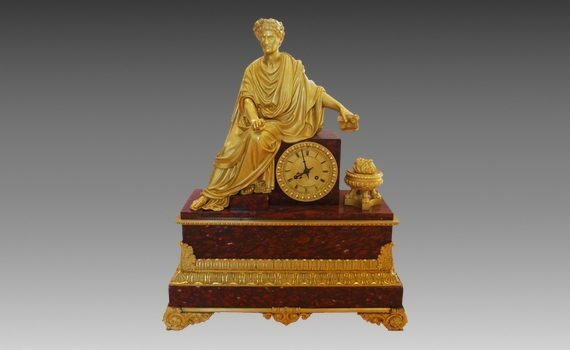 A Fine quality Louis-Philippe Clock by the renowned French foundry Deniere. The seated figure of Caracalla, the Roman emperor Antonius Bassianus Caracalla, is burning the writings of Aristotle, after he observed Aristotle was one of those sent to poison Alexander. The twin train month going movement with silk suspension is by Pons, with seal struck to back, Medaille Dagent 1823, the outside count wheel striking the hours and half hours on a bell. Both mainsprings are signed and dated Maupin et Cie, 1833. 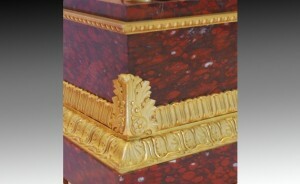 The griotte uni marble case with gilt bronze mounts in fine condition retaining their original mercurial gilding. 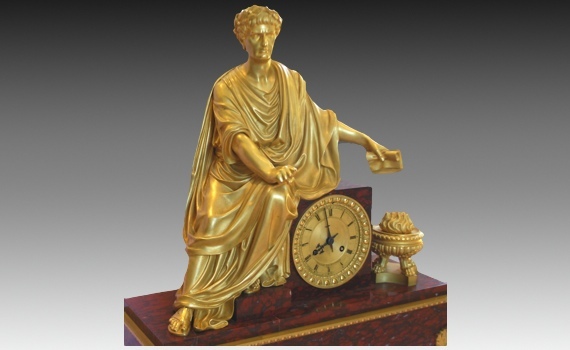 The French firm of Deniere was founded in 1820 by Jean Francois Deniere and Thomas Matelin. Matelin separated from Deniere in that first year. 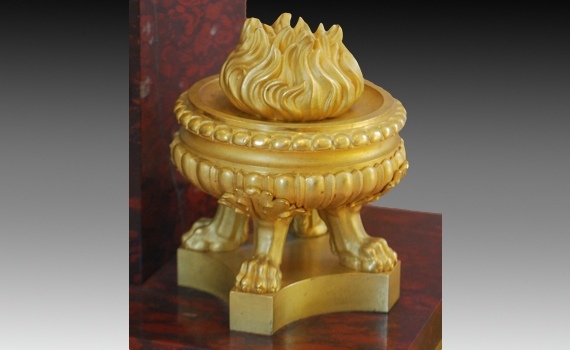 The firm earnt a prestigious reputation quickly, building on the excellence of quality in their casting and chasing of metal. Jean Francois Deniere opened his shop in rue de Vivienne in Paris, and installed his workshop in the rue d’Oleans employing 400 workers 1834. They created the monumental group in bronze ‘Apollo and his muses’ placed on top of the Opera Garnier in Paris, still visible today, and was commissioned by Tzar Alexander II of Russia. 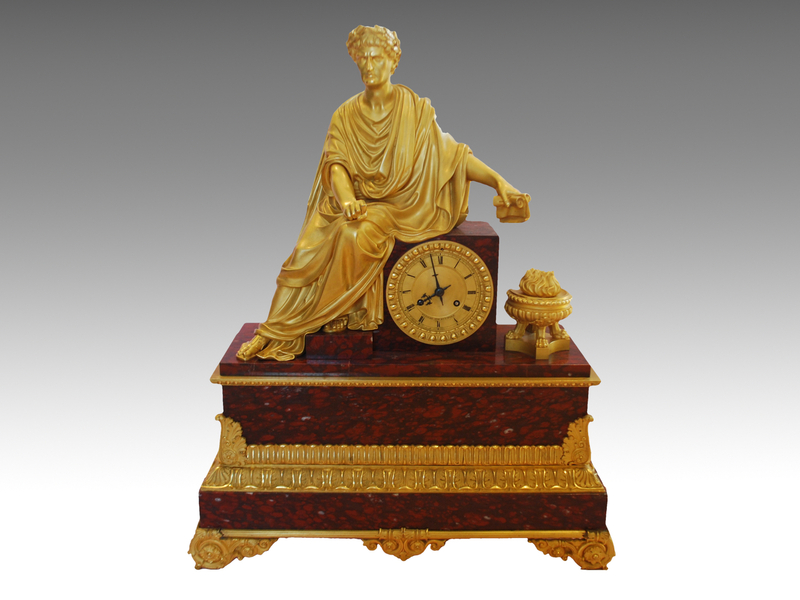 In 1849 Denieres son, Guillaume, started to work with him after studying with Chenavard and the architect Labrouste.